We have just come across email templates that our staff have designed for Australia’s Biggest companies such as BMW, Tourism Victoria, Renault, South Australian Tourism Commission, VicHealth etc. We are building a showcase folio document that shows all the templates. This will be available as a download on the email marketing area shortly. We already have a portfolio section for all the email newsletters we have done for our clients. So feel free to view that as well. Things have changed a lot in Email Marketing lately. As such, best practices have changed too. The new say of doing Email Marketing is integrating it with your CRM and you Social Media, supporting mobile devices and understanding buyer behavior. This will also be a free download from our Email Marketing area shortly. Stay tuned while we build these and send it your way. Here is Part 1 of our Best Practice Series. This covers the new onslaught of 500 million new @facebook.com email addresses and how you should market to them. We provide email marketing service for over 10 Australian Companies. They can choose between a range of platforms that suit their needs the best and use us for the strategy to improve their marketing. Contact us or click on email marketing under services for more information. If you use our DIY Email Marketing paltform, please click on the Log In > dzineMail to log into your email marketing application. If you use our Keyword Ranking Tool to improve your SEO, please click on Log In > dzineSEO to view your current rankings, keyword research and competitor information. If you have an online store with us on the dzineStore platform, please click on Log In > dzineStore to go into your shopping cart’s control panel and make changes to your products. If you use our plug and play CMS platform to make text changes to your website, please click on Log In > dzineCMS to log in and make changes to images and text on your website. The latest Keyword rankings for our site is out from DzineSEO and we now know why we are getting a higher volume of traffic. In the last few months we have aimed at getting to the front page on a number of keywords and the latest DzineSEO report shows that we are there. There are a few keywords where we have made the jump and we have come up out of the blue on a number of other keywords. This is what you like to see when your latest SEO report comes out. This is how we are getting better traffic. We have jumped spots for all the target keywords that we are focusing on. On some keywords, we have managed to make it to the top spot and mostly on the first page of Google in the matter of months. Do you want to get on the front page of Google? Our Keyword Ranking tool allows you to track your SEO efforts, see how you are ranked against keywords and see what your competitors are doing. We can help you put the right resources in place to get you to the front. 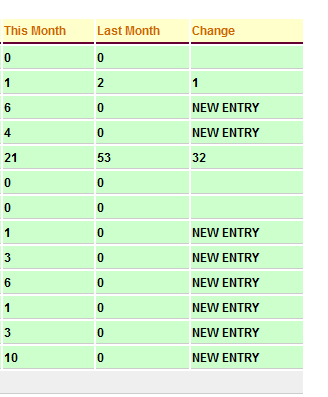 Yesterday we had the biggest number of visitors to our site since we started the site 2 years ago. Using our own SEO platform, we have also managed to get to first page of Google in a lot of Keywords which has helped. We are now setting this as a benchmark to improve our traffic even more. We would like to thank you for visiting our site and hopefully it has been informative to what you needed. We have made it super easy for you to stay updated as we update our visitors through all these channels. Here are some ways how you can stay in touch and no miss on any updates on the site. Please remember to subscribe to our newsletter as we will be giving out free eBooks about some cool stuff. Click here to subscribe to our newsletter. And also to make sure you get any updates directly on Facebook, please like us on the Facebook box on the right. You can also use our Rss feed right here on the blog to be notified about new blog posts. Click here to subscribe to our RSS Feed. You can use the existing platform and use the quick links button to drop your Tweet and Facebook Like buttons anywhere on your email. This way your email subscribers can click on these links and share your email on Facebook or tweet about your email campaign. The next thing you can do is click on the share button from your control panel. This will bring up a popup that allows you to share your email marketing campaign on Twitter, or Facebook. This way you are leveraging your email subscribers, Facebook fans and your twitter followers. And finally you get the report that shows how your email subscribers have shared your emails. The report gives you the total number of tweets and Facebook Likes for the campaign. 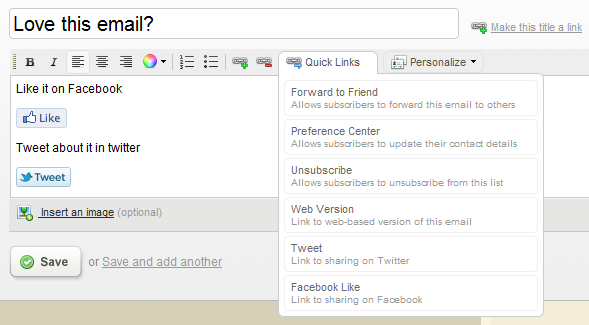 Then underneath it, you can view all the users who liked/tweeted about your emails. For our existing clients, if you would like a permanent Facebook Like and Tweet button on your email campaigns, please send us and email and we will integrate it in your email for free. We will now put a link for them on the top of all our emails. So that not only does your email goes out to your subscribers, they can then share it and post it to their friends. The installation was a breeze and is comparable to the famous WordPress Installation now. We had no issues with the installation and everything looked great. 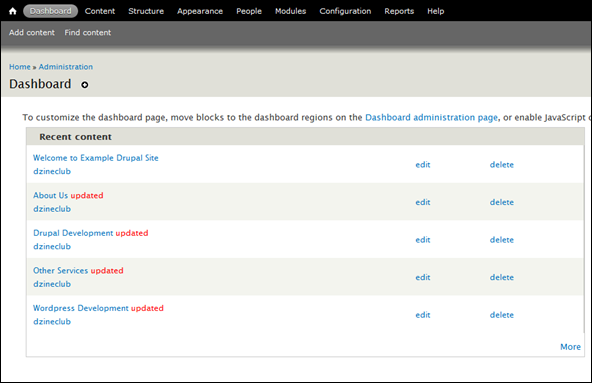 The admin panel is very easy to navigate and is clear on how to add content (as a page or an article) on the website. The rest of the page is also very well structured. 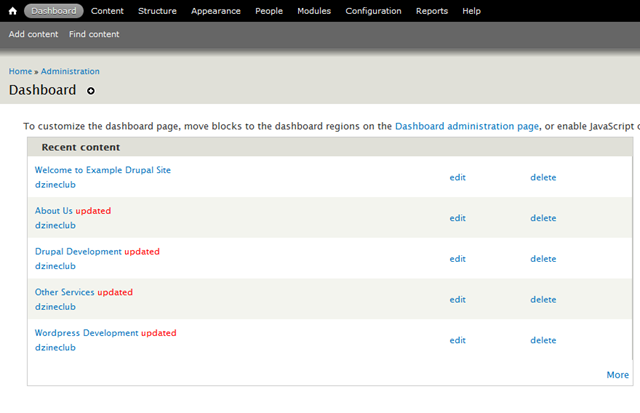 You can set up blocks from directly within Drupal which gives you more flexibility on how you want your site to look. Adding and activating themes was very easy. There doesn’t seem to be a lot of settings to change on the themes currently but with time it should improve. For our example site, we have used the Danland Theme pictured below. We have set up an example Drupal 7 website so that you can play around with the front end. 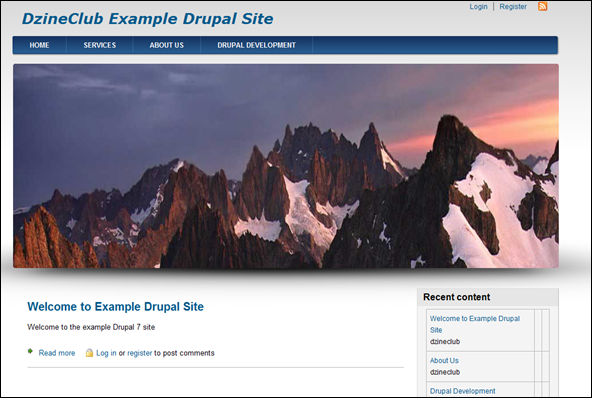 Please click here to go to the example Drupal 7 website. From next week we will be starting three new clients on our email marketing platform dzineMail. dzineMail is a DIY email marketing platform that allows you to quickly send out professional looking email to your subscribers and look at results. On top of just sending emails, the new features allow you to set up triggered emails to set up customer journeys. We are very excited to have five new clients start to use our platform in the next month. We will have a graphic design agency, a recruitment firm, an online store and two trade companies start to use the platform. This will also mean that there will be new templates in the email templates gallery. If you haven’t had a look at the email templates gallery, please view it under portfolio. We have also got some templates that our staff built for BMW for their email marketing so we will be adding them to the gallery soon. Why choose us for your email marketing? Our staff have built campaigns for the best companies in Australia and have successfully helped them implement email marketing campaigns. We are cost effective but very effective in terms of ROI. We not just provide you the tools but also guide you through the best practices for sending out your emails and getting returns on them. 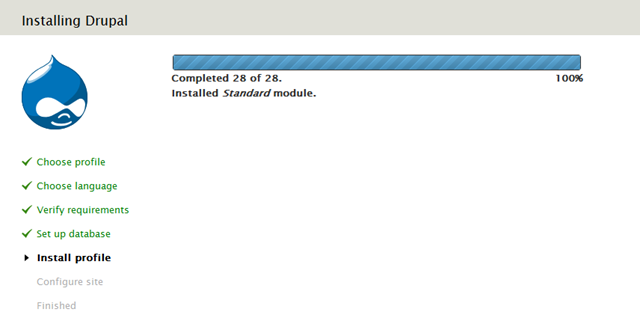 It is exciting times at dzineLabs, we are about to launch Version 2 of dzineStore. The DIY Store that allows you to have your store up and ready in minutes and start accepting orders. One feature that all of our clients wanted was multiple images against products. With the new release, you will be able to add new images to your product and have multiple images of the product. You can also choose your featured product and have the other images show up next to your main product. Previously you would have to check your email to see what had been ordered. We have now made it easier for you by allowing you to see your orders via your control panel. Not only can you see your orders, you can mark if they have been shipped or not. We are now allowing you ask for a customers email address before they start the checkout process. We will be allowing you to use more themes and customise the look and feel of your online store even more. With the introduction of themes, you can not only give the store your look and feel but you can then tweak that theme to fit your exact needs. The store already has integration with Campaign Monitor but now you will be able to also send out quick updates to your customers using the Control Panel. We will be integrating Facebook and Twitter even more in the new iteration of the store allowing your customers to tell their friends how good your product is and how happy they are to buy it. We will be integrating the like box for your Facebook Fan Page. So that your customers who might not be ready to buy from you straight away can like your store and then come back at a later stage or when you send them updates via Facebook. We all know how video helps you sell more, but we rarely put this to practice. Well you won’t have an excuse anymore once we have integrated YouTube videos with your products. The expected release date for the new version is mid February. Please subscribe to our newsletter to get notified of this new release. Of course if you sign up with the existing version of dzineStore, you will be automatically upgraded to the new version when it is out. 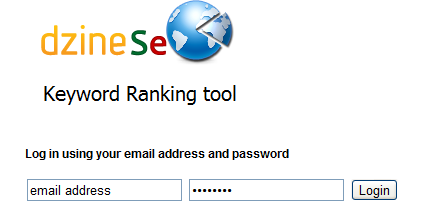 We now have a Platform Login Area where you enter your email address and password to access the Keyword Ranking Tool. The new interface is built to help you get to your stats faster. Currently It has information about your current keyword rankings, keywords, past results, information about competitors and a link to SEO resources. The Current Keyword stats now give you ranking against your keywords for upto 10 pages of Google so that you can optimise your Search Engine Efforts better. You can compare that with your last rankings on how you were ranked last time. Currently the stats only work with Google with it being the major player. Also find out how many pages are being indexed by Google and what your Alexa Rankings is. In this area you can look at your keywords and research them. To not divulge what our clients can access, we won’t discuss this much because this area gives you an advantage against your competitors. However you can add all of your keywords and look at their stats and activity around the internet. Compare your Keyword Rankings against Past Results. So if you have had an account for the last year, you can see how your keyword rankings have improved over time. Keep an eye out on your competitors. Find out what Keywords they are targeting and what keywords they are getting visibility on in Google.